Mark Burkhart, the 2008 Moto X World Supermoto Champion, 2007 X-Games Supermoto Gold winner, and 2007 AMA Supermoto Champion has formed his own supermoto race team to compete in the X Games, the Proximus Superbiker event in Belgium and the AMA Supermoto Series. The team will be called Burkhart Racing. It looks like Bernd Hiemer will have a lot harder time to defend his title this year. Bernd Hiemer injured himself badly during training with the KTM Miglio team on the Italian Ottobiano track. The landing of a jump went wrong and Hiemer was launched over the handlebars. He hit the ground hard. A fast visit to a special hospital in Milan didn't bring good news. Diagnosis: left elbow and right wrist broken several times. At present Hiemer is on the way to Bad Newstadt where he will be operated this week. Hiemer has more than 50 bone fragments floating around in his wrist. It's pretty certain Hiemer won't be there to race in the opening rounds of the season. We wish Bernd all the best in his recovery. Team PMR H2O Aprilia announced 2 new riders for 2009. They announce an agreement with the Bulgarian rider Ales Hlad and the young talent Giuseppe Di Iorio. 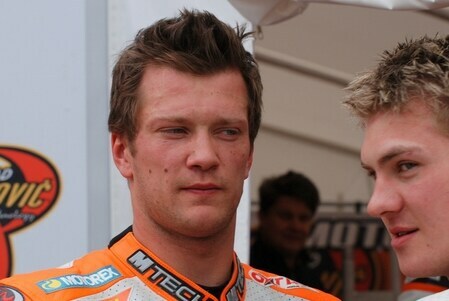 Hlad practically has exchanged bike and team with Cristian Iddon, pilot of Team PMR H2O Aprilia in 2008 and today rider for KTM Motoracing Team. The Bulgarian rider will ride the Aprilia SXV 550 in the S2 category and will participate in the World-wide Championship and some races of the Italian Championship. Iorio will ride the Italian Championship and the Aprilia Trophy. The two new confirmed pilots will join Luca Minutilli, who also rides in S2 and S1 rider Marco Dondi who will both ride in the World Championship and the Italian Championship. Good news for the World Supermoto Championship. Spanish manufacturer GasGas will be joining the championship this year with a full factory supported team. Team Gaviota SRS-Gas Gas Full Factory will participate in the World Championship with Spanish Champion Xavi Rodríguez, who will ride a GasGas SM450 in the S1 category. 19 year old Xavi Rodriquez is a big name in Spanish Supermoto winning several national Championships. The team will also field several young riders in the European Supermoto Championship. Pol Laspuertas, Spanish S3 champion of 2008 and Borja Serna, Champion of the 2007 Aprilia Supermoto Cup. With just two weeks left until the season opening round of the XTRM AMA Pro Racing Supermoto Championship, riders and teams are gearing up for an action packed series. Leading the push for team Troy Lee Designs/Red Bull/Honda/Seaspan/PPG for another national title will be none other than motocross and Supermoto racing legend, Jeff Ward. Last year’s gold medal winner at the Summer X Games stepped down from full-time racing but is back to challenge for the title in 2009.
. In this new DVD Mantix will open the doors of the biggest teams in the 2008 French Supermoto championship. Explore the world of pilots and the intensity of live racing from the inside with champions such as David Baffeleuf, Stéphane Blot, Sylvain Bidart, Kevin Berthomé, Adrien Goguet, Waren Bougard and Eddy Petard. The DVD also includes footage of the 2008 Superbiker of Mettet with Anderson, Chambon and Ward (Belgium) and footage of the Supermoto of Nations in 2008 with Bidard, Blot and Goguet (Bulgaria, Pleven). Send in pics of your bike!